Allah has warned us in His Book about the Hellfire and has informed us about the different types of punishments it will have, to the extent that one's heart splits due to fear. Allaah has informed us about its torment due to His mercy, so that we would therefore fear and avoid it. Listen to the verses in the Book of Allah that address the description of the Hellfire, perhaps it will be a reminder for you; perhaps they will cause you to repent before it is too late - before punishment strikes suddenly and you find nobody to support or aid you. 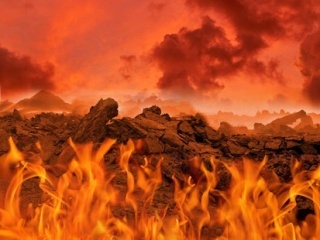 · Anas ibn Maalik (Radiallahu Anhu) reported: “The Messenger of Allah (sallallahu alayhi wasalam) said: 'Among the inmates of Hell will be a person who had led a very luxurious life in this world will be brought on the Day of Resurrection and dipped in the Hellfire, he will then be asked: `O son of Aadam! Did you ever experience any comfort? Did you (ever) happen to have any luxury?' He will reply: `I swear by Allah, no my Lord.' Then, another person, who had experienced extreme misery in the life of this world, will be dipped in Paradise. He will then be asked: `O son of Aadam! Did you ever experience any misery? Did you ever encounter difficulty?' He will reply: 'I swear by Allah, no my Lord, I neither experienced misery nor passed through hardship. '” [Muslim] This means that the dwellers of the Hellfire will completely forget any pleasures they enjoyed in this life, and the dwellers of Paradise will completely forget any type of hardship they faced in this life.